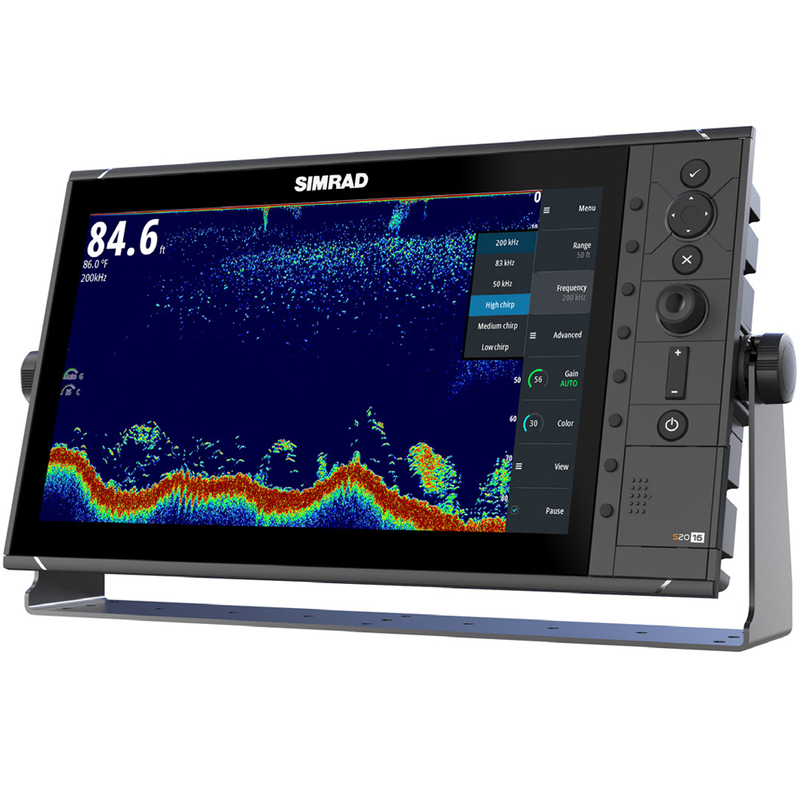 The Simrad S2016 Fish Finder combines the Broadband Sounder™ module with CHIRP technology, 16" widescreen display for an extensive on-screen history, and intuitive keypad-driven operation. Robust and offering both bracket and flush-mount installation options, the S2016 was designed to meet the need for a dedicated fish finder display aboard coastal and offshore fishing vessels. The S2016 includes a Broadband Sounder™ module with plug-and-play transducer port, compatible with Simrad and Airmar transducers equipped with blue 7-pin connectors. Adapters are available to allow easy and cost-effective retrofit of existing Simrad, Airmar, and other third-party transducers. The S2016 includes CHIRP technology, which utilizes frequency-swept sonar pulses to deliver higher resolution, improved target separation, and greater image clarity than traditional sonar at all depth ranges. Simrad technology makes CHIRP available not only on special-purpose CHIRP transducers, but also via traditional single-frequency transducers. Vessels with a suitable transducer already installed can add CHIRP technology simply by installing an S2000-series Fish Finder, offering an extremely cost- effective upgrade. With awidescreen `16" LCD disp[lay, the S2016 maximises screen size where limited mounting space is available. Its portrait orientation is well suited to fishing applications, displaying the water column with a high level of vertical detail. The S2016 Fish Finder offers a range of features to quickly and easily adjust the on-screen image to suit the task at hand. -White Line clearly separates the water column from the bottom with a high-contrast white line, for enhanced bottom visibility. Broadband Sounder™ module. Other devices may be networked via the S2016's NMEA 2000® and NMEA 0183® ports, enabling additional functionality such as waypoint marking and sharing with compatible devices.